Toenail Fungus is not an easy fix. Most prescribed medications take months to work. Over-the-counter medicines have not proven too successful as an effective treatment. This article today will go over some of the best techniques for prevention and treatment of toenail fungus. The key to prevent a toenail fungus infection is keeping your feet clean and dry, along with keeping your toenails trimmed correctly. Performing these daily hygiene habits, will go a long way ensuring fugal-free toenails. Make sure and wash and dry your feet thoroughly before putting on your shoes. When trimming your toenails, trim straight across the nail. Make sure the nail does not reach above the tip of the toe. By trimming your toenails in this manner, your delicate tissue underneath the nail are protected. Wear shoes that fit your feet correctly. An ill-fitting or a show without sufficient toe room will cause more sweating of feet, and will provide a moist, humid environment for the fungus to grow. Remove damp or wet socks and soon as possible. Be sure and dry the feet completely and put on a pair of fresh, dry socks. Before putting on your shoes spray anti-fungal powder into each shoe’s foot bed. The powder will help absorb any moisture in the shoe and help destroy any fungal organisms in the shoe bed. When using public showers, or walking in any of the locker room’s floors, always wear a shower shoe. By wearing a shower shoe in these areas; you will avoid direct contact with any fungal organisms that may be lingering on the floors of these areas. All nail clippers and any other pedicure tools should be cleaned between uses. Also, never use another’s person’s pedicure tools to avoid cross-contamination of the fungi organisms. 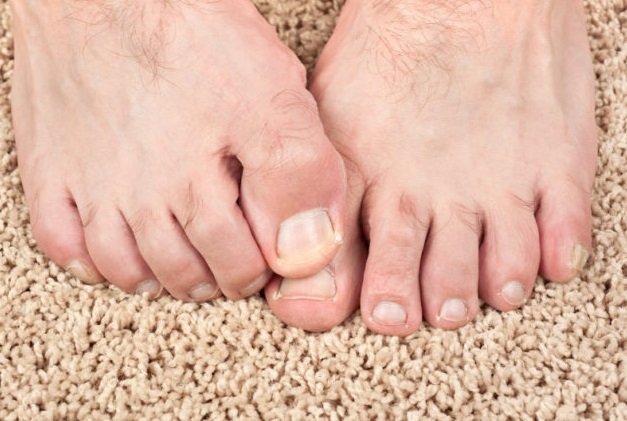 Toenail Fungus can be very painful. Sometimes it may be necessary to debride the thickened nail. By debriding the thick nail, a topical treatment can be applied and be more effective. Topical medications are used for best toenail fungus treatment. However, the medication is effective if the daily dosage is applied to the affected nail. Topical medications two drawbacks are the patient forget to apply the treatment daily or the topical medication does not penetrate deep enough into the nail bed to be effective. Oral prescribed medications have been found be some of the more successful treatment medicines for toenail fungus. Lamisil, and Diflucan are considered the most effective oral type treatment for toenail fungus infections. Side effects of these medicines are possible impaired liver function. Liver function needs to be tested monthly while on these medications. nail polish: nail polish is also an option for you, it helps you hide your nails with ugly mushrooms when going out. Now there are some nail polish products that inhibit the growth of fungi. Some famous nail brands, LDS nails, Kiarasky gel polish or opi gel polish are also the notes for you. Yes, toenail fungus infection can be avoided. The key is good hygiene for your feet and following correct pedicure techniques. If you do have a toenail infection, remember, without treatment, the pain and damage will continue. « Nail Polish Myths: Did you get cheated?